Ole Lukkøye - "Dream of the Wind 1989-91"
This was a very limited edition compilation CD of the bands earliest material. I can tell you this is totally different from anything that you have ever heard from the band. The CD has 11 tracks. The intro track is just some percussion and a simple keyboard line. 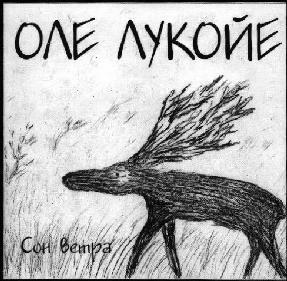 The label for this CD is all in Russian so I am not sure who all plays on the CD but it is mostly three people per track. The next track starts similar to the intro but then builds a bit at the end into a sort of dreamy new age space song with some horns. It could be used in a Star Trek episode. Track 4 is the first track where you might think it was Ole Lukkøye, but it is more spaced out. All these tracks feature a lot more synths, little or no vocals and very little guitar. Track 5 starts with a sample from a world II movie and then sort of drones on to the end with some effected synth lines. Strange. The rest of the CD is mostly synthesizer music with some drums and vocals on tracks 7 and 9. Very strange stuff. Check it out if you are curious to hear where the band started from but I don't feel this is essential to track down for the average fan.